I have two posts today. If you are looking for my MFT Die-namics Feature & Pep Rally Post, please scroll up or click HERE. Thank you!! 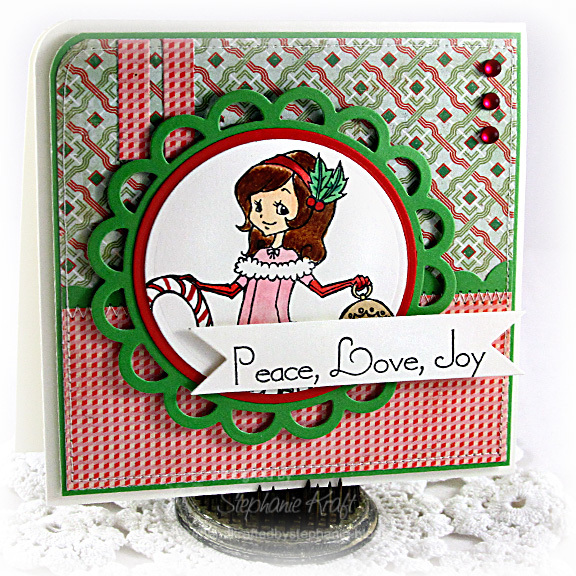 Welcome to week 2 of the current Sparkle Creations Rubber Stamps Challenge! 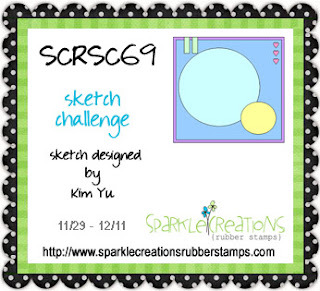 The current challenge (SCRSC69) is a sketch challenge (sketch courtesy of the fabulous, Kim Yu!). Please note that this is the final SCRS challenge of the year. We will be back on January 3, 2012! Accessories: Die-namics Wonky Scallops Border, Die-namics First Place Award Ribbon Die, Die-namics Open Scallop Doily (MFT); Standard Circle Nestabilities (Spellbinders), Markers (Copic), Frosted pearls (Pizzazz Aplenty), Foam tape, Thread, Sewing machine. What a fab take ont he sketch Steph! I love how you did the sentiment and rounded corner! Very sweet card Stephanie! Adorable image and great mix of patterned papers!